Bet you never thought looking professional can mean looking so good! The Dickies 9-Pocket Utility scrub pant is too good to be true, with 9 pockets available for storage galore. The drawstring front and the elastic back waist give you flexibility, and multi-needle contrast top stitching will ensure that this piece lasts. Get this! 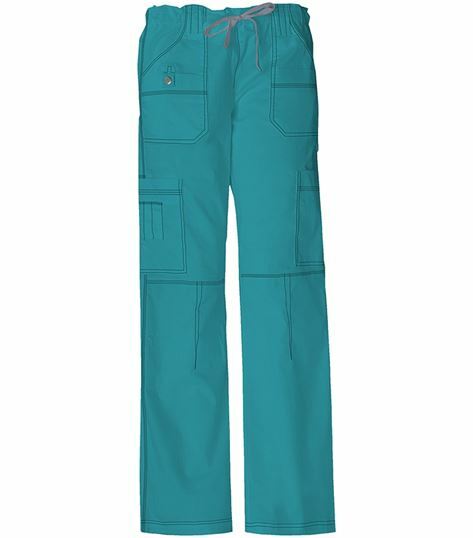 You don’t have to suffer from annoying, stiff material when you move around in scrub pant 857455, because front motion knee darts allow you to get around in comfort! And the famous Gen Flex material, which is lightweight and flexible, will keep you feeling awesome all day long! I'm not done yet- another score for this pant is the elastic bungee loop; place your ID in the loop for a neat, professional presentation. 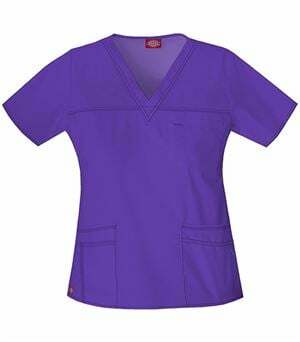 Best of all, no more hiding behind baggy scrubs; a snug, junior fit will show off your figure, and the low rise lends a hip, modern edge to the scrub pant, perfect for the hip, modern woman. After buying many different sets from different manufacturers these are the best I have come across. The color never fades even with bleach, and the fit is great! The pants are roomy, and tops run true to size. I am 5'2" and find the regular length hits right at the heel (petites looked short & silly). Love this pant. Fits great and lots of great pockets. I have almost every color. 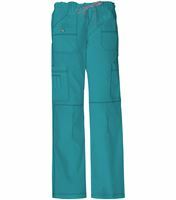 I am continuously looking for a quality scrub pant that has lots of pockets for storage and is comfortable. This one fits the bill. They are so comfortable, stretchy, and the fabric has a higher quality feel than most. Best of all, they are stylish. 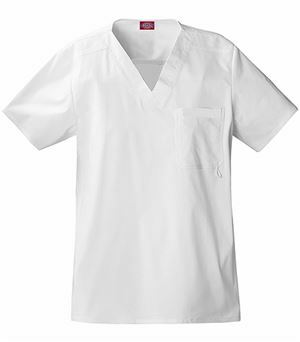 On the first day I wore them, four other nurses asked me about them and are going to purchase them. Love these scrubs! Great fit. Plenty of pockets. Very comfortable during a 12 hour shift. LOVE, LOVE THESE PANT'S! I REALLY LOVE THE FEEL OF THE FABRIC, GREAT QUALITY. Not quite as soft as I hoped they would be but I love how many pockets they have. They fit great, length & width. I'm sure in time they'll soften up- other than that they're great! These pants are one of my favorite. They fit by bootie perfect! Have several pair. So these are the best scrub pant I have ever owned! They are confortable and look so good I don't mind wearing them outside of work. I have 9 pairs and plan on completing the collection when I have every colr in tall that I can get. The styling of these pants is great. Problems: inseam - either too short or too long. Also, the material is very sheer, be careful what you have underneath. Best scrubs ever, they are so comfy, love it!! I'm ready to purchase another set of this scrubs. These are my new favorite scrubs. I've ordered 3 pair. Super flexible and comfortable! Pockets are great! These pants are the best I've ever put on - but I had to return them because if your facility requires you to wear Wine, Dickies opted to dye these RED (but call them wine). I love the stylishness of these pants and they are comfortable. Got lots of compliments when I wore them! These pants are fabulous!! They have a pocket for everything. The color selection is awesome, and I love the fabric: It is easy care and and has Stretch (but looks young and stylish)! Love all the pockets! Vibrant colors to chose from. Love, love, love, these pants! I love how they fit and the fabric is very comfortable. I bought a few pairs of these, in different colors of course! These pants are very comfortable. Will definitely buy more. Loved these pants. Just enough stretch to add extra comfort. Lots of compliments on the look. Extremely comfortable and has a nice soft feel to them. They give you room to move with the bonus of having good cargo pockets. These pants have extra stitching to add style to normal scrubs. I really like thes scrub pants! All the pockets are fantastic and I love the look of the pants. The only thing I am not a huge fan of is the low rise at the waist. I was skeptical about measuring for scrubs and ordering, but it was easier that going in and trying on several pair. These fit well and I appreciate the variety of pockets! Also I wasn't sure about the lack of elastic at the waist, but so far so good. I will order these again. Tailor-made for me. Very comfortably suited for my work environment. Allows me to be me @ work, free style. These pants fit great until I washed them, but now they are a little too short and a little too tight. The material is a nice quality, and the style is great. 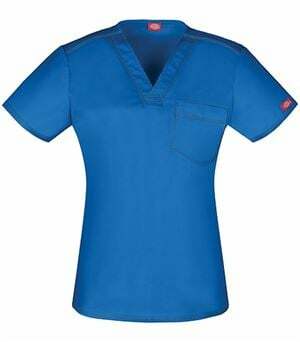 This is a great scrub set. Love the color, good prize, true size. The pewter gray is nice. Not too dark and not too light gray. I'm petite 5' 1" and I got the xs pants. The length is perfect. However, it is kind of baggy/flares out at the bottom. These are the only scrub pants I buy. Very comfortable, lots of pockets & perfect length for my 5'1" frame. Great prices too if you use the coupon codes!! The contrast stitching is much more obvious in real life than in photos. Material feels a bit stiff. Pretty color, though. I bought these pants in different colors and they are lovely. They runs bigger but they are very comftables and durable.